A Gasket or a Seal can be manufactured by us in any grade of rubber and we are here to assist in the selection of the correct type. The type of Seal is dictated by many criteria, but mostly by the medium being contained, the operating temperature and pressure, bolt loading and special requirements such as water approval or food contact. Let our technical department with our wealth of knowledge, advise you on the best grade for your application;- A firm sponge seal might be better than a soft solid rubber seal and might be cost saving. Although the bulk of our business is the conversion of rubber sheeting to a gasket shape we also stock a range of rubber extrusions and sections for door seals. 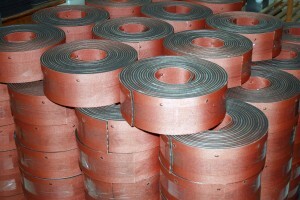 Rubber Cord sections can be joined to form O-Ring type seals. Rubber mouldings and grommets can be made in any polymer.